Located in the midwestern and northern regions of the United States, is the 12th largest state of the country by area. As of 2017, the state comprises a population of 5,554,532 inhabitants. Minneapolis, which has an estimated population of 413,651 people, is the largest city in the state. Saint Paul, the capital of Minnesota, is the second most populous city and as of 2016, had an estimated population of 302,398 people. Rochester is the third most populous city with an estimated population of 114,011 inhabitants. There are 17 cities in Minnesota which have populations of more than 50,000 people. Bagley, which is located in Clearwater County, is the least populous city in the state with an estimated population of 1,400 people, as of 2016. The state has 87 counties. 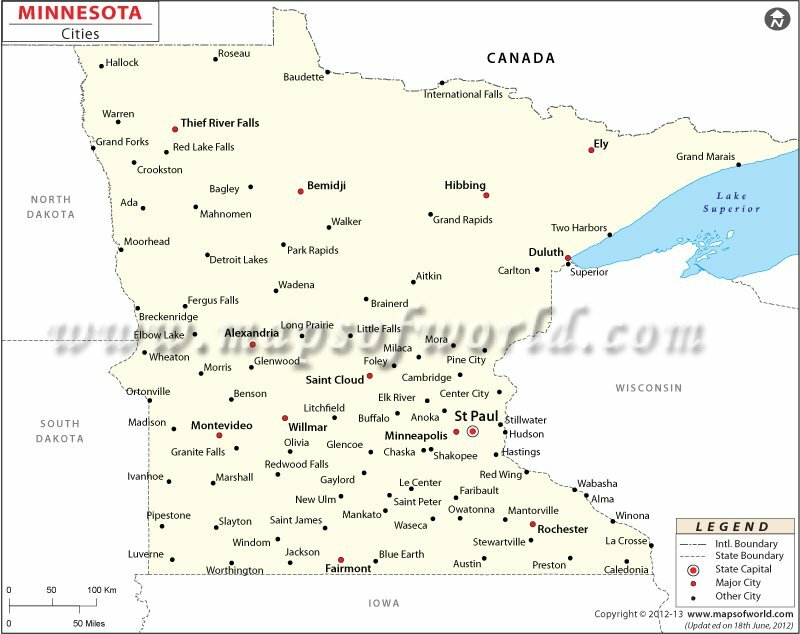 The state capital is Saint Paul while Minneapolis is the largest city in Minnesota. Minneapolis' broadway scene and Saint Paul's laid-back charm make these Twin cities a major cultural and economical center in the Midwestern US. The Minnesota State Fair in Falcon Heights is the among the largest state fairs in the US. Lapped by the Lake Superior, the city of Duluth bills itself as “The San Francisco of the North.” Globally renowned Mayo Clinic is headquartered in Rochester. Bloomington houses the largest shopping mall in the country, Mall of America. A bedroom community, Brooklyn Park features the Edinburgh USA Golf Course. Plymouth, Maple Grove, Woodbury, and St. Cloud are other major cities in Minnesota. Minneapolis–Saint Paul International Airport (MSP) and Duluth International Airport (DLH) serve the state. Amtrak's Empire Builder passenger train passes through the state. Interstate Highways I-35, I-90, and I-94 and U.S. highways traverse the state.